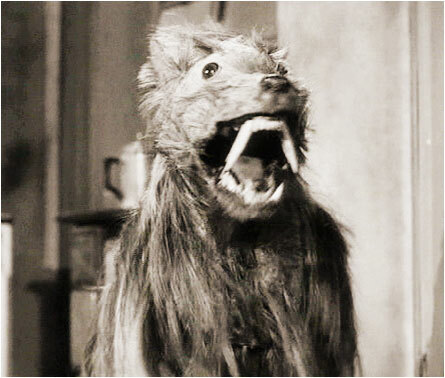 Looking forward to Return of the Killer Shrews, a re-boot of Attack of the Killer Shrews, a 1959 sci-fi semi-classic where everyone walked around in black and white and were assailed by science-made growth-spurt shrews that looked uncannily like dogs with shag bath matts taped to ’em. A scientist sequestered on an island screwed up and invented mouse-sized rodent shrews that grow to the size of dogs wearing shag bath mats. They also breed like crack whores. It’s estimated that there are 200 to 300 bath mat dogs running wild on the island. I counted six. And since food is scarce, turning the mutts into cannibals, everything (i.e., you) is on the menu. The house where a few people are holed up is made of adobe, a natural building material made from sand, clay, water, and some kind of fibrous or organic material – sticks, straw, and/or manure, which is shaped into bricks using frames and dried in the sun. (I didn’t make that up, the internet did.) The beasts gnaw through the chewy walls to get to the screamy filling inside. 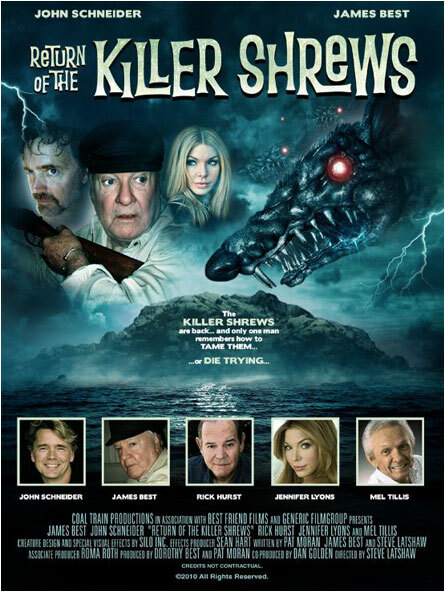 Though there’s too much talking and not enough bleeding, Attack of the Killer Shrews does have some heartwarming moments, like the attack parts. Let’s hope the remake ups the DKB (die, kill bleed) factor. 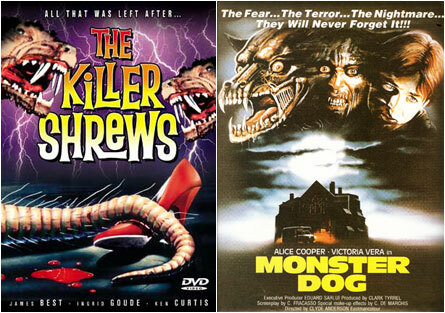 You may have noticed that the original killer shrews look a lot like the monster dogs in Monster Dog, the 1984 horror schlock plopper starring Alice Cooper. While I can wholeheartedly believe in the existence of monster dogs, the story became unraveled watching Alice walk around in a pull-over cardigan sweater. Descendants of monster dogs and/or rock stars really shouldn’t do that. But I digress. While we’re all waiting for Return of the Killer Shrews to warm our living rooms in TV’s warm glow, and since this is first and foremost an educational blog, let us take a moment and rejoice in the palm-sized furry wonder that is the pre-mutated shrew. A shrew, or shrew mouse (family Soricidae), is a small mammal classified in the order Soricomorpha. Although its external appearance is generally that of a long-nosed mouse, a shrew is not a rodent, as mice are, and not closely related to rodents. Shrews have sharp, spike-like teeth, not the familiar gnawing front incisor teeth of rodents. There are 376 species of shrew – all waiting to chew your face clean off. This entry was posted on February 4, 2011 at 4:44 pm and is filed under Nature Gone Wild, Science Fiction with tags Nature Gone Wild, Science Fiction. You can follow any responses to this entry through the RSS 2.0 feed. You can skip to the end and leave a response. Pinging is currently not allowed. But the best news of all is the teaming of John Schneider and James Best–Bo Duke and Sheriff Roscoe P. Coltrane, back together! Here’s hoping they use the General Lee to jump over them shrew-dogs.